There’s a lot to be said for halogen lights. They’ve maintained market dominance in the automotive lighting industry since cars first had lights. Even with the disruptions caused by HID- and now LED technology. That’s not to say they’re the best or customer preferred option. It’s more that they’re the cheapest option that still gets the job done. 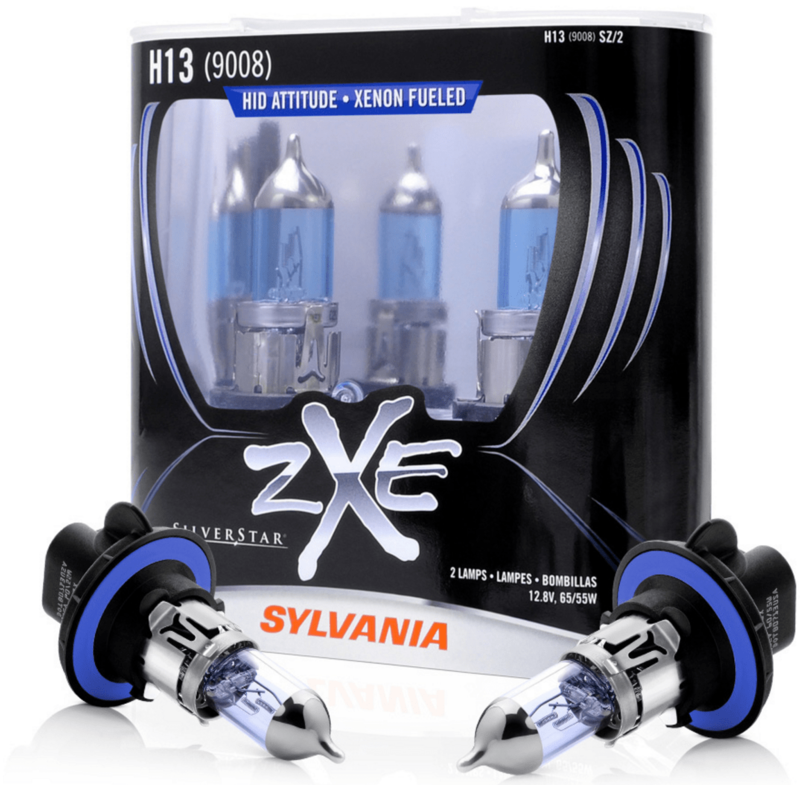 For this reason, we decided to do a Sylvania Silverstar zXe headlight review. But what is one to do when your car is supplied with plain boring halogens, yet you really want the cool look of HIDs? You could opt for an HID kit. Fork out $50 for some bulbs and ballasts. But how far will that really get you? Now you have to try and mount the ballasts somewhere. Your car might not recognize the lights correctly, causing errors on your dash. They might flicker, or worse not shine correctly, resulting in everyone thinking you’re driving with your hi-beam on. And to top it all off, they most likely won’t even be DOT or SAE compliant. An alternative to this hassle is the Sylvania SilverStar zXe. Sylvania advertise the zXe as having a crisp, white light. The aim of this is to give the look, feel and attitude of HID lights. HID lights have a certain visual appeal to them. By offering a halogen light with the same look as an HID, Sylvania can cut down on the portion of people buying off-brand HID kits purely for the look. To help reinforce the HID component of these light bulbs, Sylvania make use of their proprietary xenon halogen gas technology. True HID light bulbs are often referred to as xenon light bulbs, due to their use of xenon gas. The light bulbs feature a cobalt blue coating to provide the optimal light transmission and colour output. This is supplemented by a mirror top alloy coating, which provides a jewel-like appearance to the headlights. Sylvania advertise this product as the best alternative to implementing an HID upgrade. Also providing the best value in comparison. The zXe gets a number of thumbs up, especially for being SAE/DOT compliant. Sylvania’s marketing pictures for the zXe show a series of cool looking guys posing in front of modded cars with girls chilling in the background. They are rather entertaining, and clearly show their intended market. When you refer to the below image, you can see how Sylvania rank their SilverStar range of products from low to high, directly comparing their brightness, clarity and color. Only the zXe is set alone. Above the rest. Demonstrating its uniqueness. Sylvania’s top performing product, the SilverStar Ultra, has a color temperature of 4100K, while the zXe comes in at a 4200K. This is not a major difference in pure color, but the zXe has enough differences in its composition to give it a visibly different light. We’ve spoken about Sylvania before. They are the American based subsidiary of Osram. Osram are one of the leading manufacturers of lighting technology around the world. They offer products for a variety of industries, and you’ll even see them in your home installations. For the automotive world they offer a variety of products. They are an OEM supplier for a number of car manufacturers and they develop and sell a number of HID, LED and halogen products to suit everyone’s needs. Sylvania is a well-known brand, and their products will reflect their desire to ensure reliable, good looking and well performing products. Sylvania recommend changing your halogen bulbs every 2 years or so as the bulbs do dim with time. If one of your bulbs blow, it is advised to replace both headlights at the same time. This ensures that you do not suffer from an uneven light due to one bulb being newer than the other. If you do this, keep the good bulb in your glove-compartment, you never know when it may come in handy. Another reason for dimming with time is the degradation of your headlight lenses. The US based non-profit organization Consumer Reports had quite a bit to say about headlight cleaners. Because there are a growing number of old cars on the road, occurrences of headlights that are cloudy or hazy has become more common. This coupled with a change in regulation allowing for plastic lenses, as opposed to previously standard glass sealed-beam headlights, has sprouted a small headlight cleaning industry. Based on their measurements, headlight effectiveness can be hampered by up to 80%. Obviously that is quite a severe case, but someone was driving around with those headlights. Damage to headlight lenses is mainly cause by ultra-violet (UV) light from the sun, so cars that spend more time outside are more prone to being affected. If you feel that your car is suffering as a result of faded headlight lenses, you should try out one of the cleaning solutions. Sylvania’s Headlight Restoration Kit is one of the top rated products. Overall the Sylvania SilverStar zXe has the highest rating amongst the HID look alike halogen products. In general customers are impressed with how white the lights are, even comparing the zXEs to the SilverStar Ultras, a noticeable difference was evident. Major complaints are those of the bulbs failing too early. This seems to be more of an expectations vs reality issue though, as these complaints are visible across the spectrum of halogen lights, and in no way specific to the zXe. A reasonable estimate of 18 months for these light bulbs seems appropriate. Those who really appreciate the light seem to not be put off by the lifespan, and end up purchasing another set. There does seem to be some controversy though, with several complaints stating that these are not noticeably whiter than the SilverStar Ultras. This is not unexpected as their claimed color temperatures aren’t that far apart. This could be as a result of slight deviations in the manufacture of both types of bulbs, resulting in some Ultras being whiter than normal, and some zXes being less white than normal. As with most products, the Sylvania SilverStar zXe does not exist on its own. Both Philips and GE have products aimed at the same market. Philips offer the CrystalVision Ultra product at a surprisingly reasonable $23 – $28 for a two pack. It also advertises as having a bright white xenon look, although with a color temperature rating of only 4000K. It also features blue-capped bulbs to provide the crystal appearance. The Philips product comes with a 1-year warranty and is DOT/SAE compliant. GE’s offer is called the Nighthawk Xenon. This title can be a bit confusing as it may make some people think it is actually an HID product, when in fact it is of the halogen variety. That may be intentional and GE offer this product as a revolutionary solution, providing performance and style close to HID-calibre, but much cheaper (their words). It has a rather broad price range of $31 – $46 depending on which bulb you require. The Nighthawk marketing claims a crisp, bright white light which they say is close to daylight. No color temperature is given, but we expect it to be 4000K+. The GE product makes use of such technological innovations as an ultra-fine filament, a specialized coating and xenon gas. This is backed by a 1-year warranty and DOT/SAE certification. If you gave majority of new car purchasers the choice in what kind of lights they’d like in their car, they’d tell you LED. If you said for some reason they’re not allowed LED, they’d say fine, and opt for HID. Halogen is at the bottom of most people’s lists of choice of lighting product, yet we live in a world filled with halogen light bulbs. We continue to blame the manufacturers for not providing our cars with these nice lights, but ultimately the fault lies with us. Well maybe not completely. Currently LED and HID lights are offered as extras on the purchase of a new car. Expensive extras. They’re seen as a way for car manufacturers to make further profits. They build a basic car as cheap as possible, get you in the door, then heap on the extras. And the percentage profit on extras is far higher than on just the car. At the same time, if car manufacturers stopped installing halogen lights, it would minimize the number of variants they need to produce, lowering costs. It would increase the volume of HID and LED lights being produced which would lead to further cost cuts. But such a utopia seems far off at the moment. Both LEDs and HIDs are better for a number of reasons when compared to halogens. They last longer, they’re significantly more efficient (LEDs even more so than HIDs) and thus can provide much brighter lights. They also offer a wider variety of color options, although this is more to individual taste. The white light that the most popular products produce is considered far better for night driving than the yellow light that standard halogen bulbs produce. This provides improved contrast for identifying obstructions, and better mimics natural sunlight. While several LED and HID replacement kits exist to allow one to upgrade their headlights, these come with a risk. They require additional electronics in the form of a ballast (HID) or driver (LED). This usually takes the form of a cigarette box sized module that plugs in between the car’s electronics and the headlights. It often has to be mounted and can get in the way. Ideally a headlight enclosure is designed around a specific light bulb. Thus when LED and HID bulbs are inserted into housings designed for halogens, light distribution can be affected. Often this is resolved by adjusting the headlamps, but in other instances this is not possible. As a result, none of the producers of HID or LED kits offer any kind of DOT or SAE certification on their products. And then, as earlier mentioned, cost. The main driver for the continuation of halogen bulbs. As such, majority of people opt to purchase cheap ($10) or not so cheap ($35) replacement halogen bulbs instead of forking out the money for potentially illegal HID ($50) or LED ($100) bulbs. The SilverStar zXe is a direct part replacement for standard halogen light bulbs. Although from appearance it may look slightly different, dimensionally it will be identical to what you are taking out of your car. Sylvania offer this product in the standard range of forms, so you’ll be able to fit this as a high-, low- or dual-beam to any car. 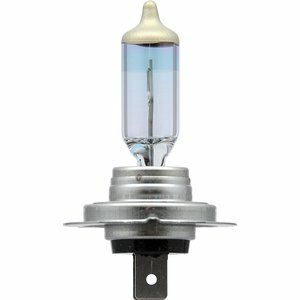 The time taken to install these bulbs will be limited only to your car’s design, as it should be as simple as removing a cover, unscrewing the previous bulb and installing this one in the reverse order. Quick and simple. As always when replacing bulbs, it’s advised to wear gloves of some form. This is mainly to prevent any residue being applied to the light bulb’s glass, but can also protect your hands if the glass happens to break while you’re working with them. The Sylvania SilverStar zXe is what it claims to be. It is a halogen light designed to replicate the look of an HID setup as much as possible, and on the whole achieves this to a satisfactory level. Although there are several complaints about the product, there is nothing of particular concern. Other light bulbs in the same market reflect a similar level and type of complaint. Taking this into account, the Sylvania product manages an overall better rating than either the Philips or the GE product. While we’d advise staying away from the GE product, both the Sylvania and Philips products have received good feedback. Although scoring slightly less, the Philips comes in on average $10 per pack cheaper than the Sylvania. Ultimately we’ve reviewed the Sylvania SilverStar zXe and do recommend this product. It has an acceptable lifespan and provides on its claims. If the price is a real concern, the Philips would make an appropriate alternative. SYLVANIA Headlight Bulb Comparison Chart: SilverStar vs XtraVision Sylvania Silverstar Ultra Review Philips X-Treme Vision Review: Deep Dive & Expert Review PIAA Xtreme White Plus Review: Worth the Money? » LED vs Halogen Headlights: Which is Better?